The future of the smart home market looks attractive with opportunities in the home safety and security, appliance, entertainment, lighting, HVAC, healthcare, and kitchen applications. The global smart home market is expected to reach an estimated $107.4 billion by 2023 with a CAGR of 9.5% from 2018 to 2023. The major growth drivers for this market are increasing awareness related to safety and security, increasing consumer need for simplicity and personalized experience, and the growing adoption of cloud-based technologies. Emerging trends, which have a direct impact on the dynamics of the smart home industry, include development of voice assistant technology for high-end automated households, emergence of air quality sensor devices that measure volatile organic compounds (VOCs), and growing adoption of video enabled drones. A total of 82 figures/charts and 87 tables are provided in this 169-page report to help in your business decisions. Some of the smart home companies profiled in this report include Honeywell, Johnson & Johnson ADT Corporation, Control4 Corporation, United Technologies Corporation, Siemens AG, Philips, Acuity Brands, and Vivint Inc. The researcher forecasts that the safety and security market is expected to remain the largest segment due to the increasing need for continuous monitoring services to reduce the risk of crime, burglary, and theft. The entertainment segment is expected to experience the highest growth rate during the forecast period, supported by the increasing need of advanced technology that can provide a single platform for high level of control, flexibility, and deliver the best entertainment experience. Within the smart home market, the wireless segment is expected to remain the largest technology. It is also expected to witness the highest growth over the forecast period due to the increasing demand for Zigbee in healthcare, safety and security applications to support remote monitoring facilities, and consumer comfort and convenience enhancement. Asia Pacific is expected to be the largest region with the highest growth over the forecast period due to the increasing adoption of cloud based technologies and increasing awareness related to safety and security. Increasing population, urbanization, rising standard of living, and increasing government expenditure on smart cities will further spur the growth in this region. Market size estimates: Global smart home market size estimation in terms of value ($M) shipment. Trend and forecast analysis: Market trend (2012-2017) and forecast (2018-2023) by segments and region. 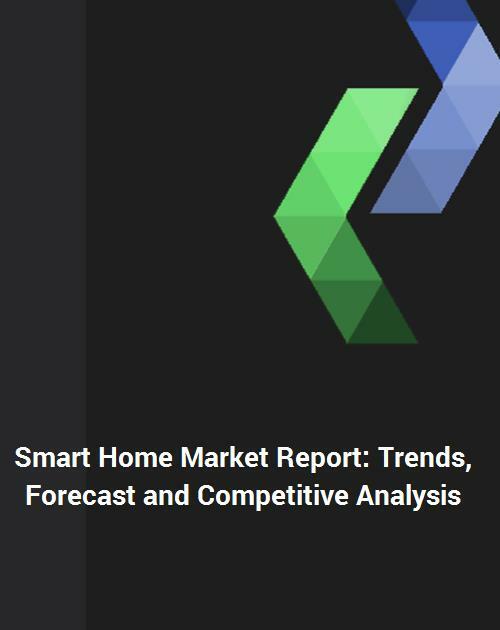 Segmentation analysis: Global smart home market size by various applications such as application, product and service, and technology in terms of value and volume shipment. Regional analysis: Global smart home market breakdown by North America, Europe, Asia Pacific, and the Rest of the World. Growth opportunities: Analysis on growth opportunities in different applications and regions of smart home in the global smart home market. Strategic analysis: This includes M&A, new product development, and competitive landscape of smart home in the global smart home market. Q.1 What are some of the most promising, high-growth opportunities for the global smart home market by application (safety and security, home appliance, entertainment control, lighting, HVAC control, home healthcare, smart kitchen, and others), by type (product and service) by technology (protocols & standards and wireless), and by region (North America, Europe, Asia Pacific, and the Rest of the World)? Q.4 What are the key factors affecting market dynamics? What are the drivers and challenges of the smart home market? Q.5 What are the business risks and threats to the smart home market? Q.6 What are the emerging trends in this smart home market and reasons behind them? Q.7 What are some changing demands of customers in the smart home market? Q.8 What are the new developments in the smart home market? Which companies are leading these developments? Q.9 Who are the major players in this smart home market? What strategic initiatives are being implemented by key players for business growth? Q.10 What are some of the competitive products and processes in this smart home area and how big of a threat do they pose for loss of market share via product substitution? Q.11 What M&A activity has occurred in the last 5 years in this smart home market?